Large companies in Africa are growing faster than their peers in the rest of the world, raking in $1.4 trillion in annual profits and contributing to government taxes and higher wages, a new report finds. The continent has 700 companies with annual revenue of more than $500 million, 400 of which generate more than $1 billion, says the new study from the McKinsey Global Institute (MGI). These large companies consist of both African-owned brands and foreign-based multinationals operating within the continent across a wide range of sectors. Five years ago, African economies were accelerating, and the continent was home to six of the world’s ten fastest-growing economies. Yet that sunny confidence has waned due to the drop in oil and commodity prices, besides the sociopolitical instability that came along with the Arab Spring. Despite that, African companies have become new drivers of economic growth, contributing not only to wages and taxes but also to innovation and technology dissemination. MGI estimates that the largest 100 companies by revenue contribute to an estimated 50% to 60% of corporate taxes in Africa. Just over half of these large firms are African-owned, 27% are foreign-based multinationals, while the remaining 17% are state-owned enterprises. The multinational corporations dominate in the food and agricultural sector, while state-owned companies play a bigger role in resources, utilities, and transportation sectors. In contrast, state-owned companies operated mostly in their home countries, diversifying less and focusing heavily on resources and utilities. Family businesses make up only 10 to 20% by revenue of these companies, a sharp underrepresentation when compared to other global regions. The report also shows that South Africa stands as a unique example of large company growth than the rest of the continent. The country is the only one that has a globally comparable prevalence of large companies and accounts for nearly half of all Africa’s large companies. North African countries account for one-fifth of the continent’s large companies. However, despite the continuous growth, Africa is still heavily underrepresented in global business in both the number and size of large companies. 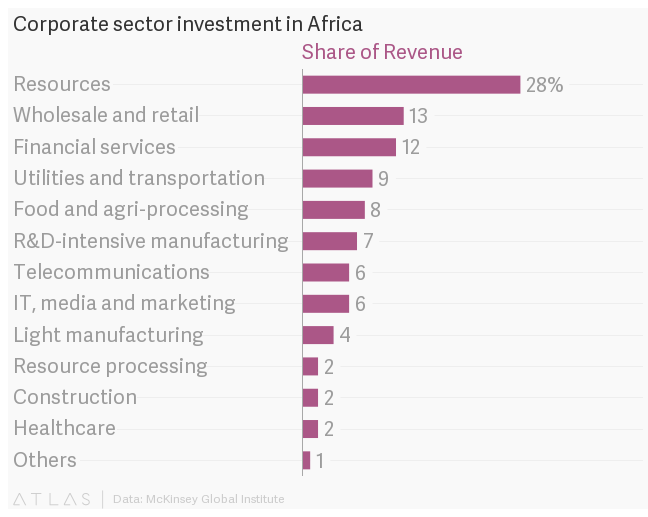 The continent needs more of these companies, the report says, so as to drive growth and increase investment, corporate tax contributions, exports, and productivity.